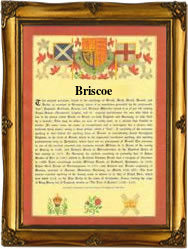 This unusual surname is of northern English origin, and is locational, either from the village of Briscoe in Cumberland, or from Briscoe in the North Riding of Yorkshire. The former, recorded as "Brethesco" in the 1203 Pipe Rolls of that county, and as "Brisco" in 1204, derives its name from the Old Norse "Bretaskogr" meaning "wood of the (Strathclyde) Britons". The latter is so called from the Old Norse "birki", birch, plus "skogr", a wood; hence, "birch wood". Locational surnames, such as this, were usually acquired by a local landowner, or by the lord of the manor, and especially by those former inhabitants of a place who had moved to another area, usually in search of work, and were thereafter best identified by the name of their birthplace. The surname is first recorded in the early half of the 14th Century (see below), and one William Brys(k)how appears in the Yorkshire County Rolls, dated 1410. Recordings from Yorkshire Church Registers include: the christening of Ann, daughter of Thomas Briscoe, on September 16th 1607, at St. Peter's Church, Leeds, and the marriage of Gilbert Briscoe and Margaret Payte on July 25th 1621, at Skipton in Craven. The first recorded spelling of the family name is shown to be that of Robert de (of) Briscaw, which was dated 1332, in the "Subsidy Rolls of Cumberland". during the reign of King Edward 111, known as "The Father of the Navy", 1327 - 1377. Surnames became necessary when governments introduced personal taxation. In England this was known as Poll Tax. Throughout the centuries, surnames in every country have continued to "develop" often leading to astonishing variants of the original spelling.